Summary: Self-help guru Julia James is so good at being single that she's become famous for it-advising women that they don't need a man to be happy. Then the unthinkable happens. 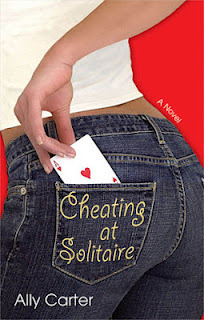 Just when her newest book, 101 Ways to Cheat at Solitaire, is about to hit stores, a trumped-up piece of gossip linking her to a gorgeous actor hits the papers. Their pictures are splashed all over the tabloids, and now Julia's credibility is about to hit rock bottom. But she isn't going down without a fight. Unless, that is, the actor is going down with her. Review: I originally bought this book because Ally Carter is coming to the Austin Teen Book Festival and it sounded really good, I am so glad I did. This is an adult book, but I think older teen fans of Ally's work would really like it as well. I certainly did! Julia is awesome, she is what I want to be like if I stay single for that long. She is strong and independent and when she is with Lance their chemistry flies off the page. Yes this is a "chick-lit: novel and it is awesome. I was feeling down the day that I picked it up and it made me happy inside. I felt really invested in what was happening to Julia's career, I found myself caring as if she was my friend, this just solidifies what a great writer Ally is. I definitely recommend you pick up this book especially if you need something light but good!